Game-based learning is still fairly new, and it can require lots of effort and superhero powers for teachers to bring games into the classroom. Reducing the effort and scaling the use of gaming in the classroom was the problem we at SMART set out to solve a few years ago. We’ve learned a lot over those years about what is effective in making learning engaging and enjoyable. In this blog I’ll share some of our insights here on how teachers can bring gaming into their classrooms easily and how we’ve built a set of tools that help them. For a long time, we’ve had a lesson creation tool called Notebook that allows teachers to bring interactivity to their lessons on the board and better engage learners. Several years ago, we noticed that some very technologically advanced teachers were creating interactive and game-like content using some professional design tools like Adobe Flash to help teach the content they created and were using in their classroom. It was heavy lifting. It required coding and a significant investment of time, but the content really engaged learners. These pioneering teachers in game-based learning shared their work with other teachers and there were some positive results. Many teachers had the desire to bring games into their classrooms. The challenge was that the game content rarely fit their needs without some tweaking. While they had lesson content that fit their curricula well, they didn’t have the time, skills, or both, to create a game that fit their lesson content and teaching. We began with this simple insight and we created SMART lab. Our goal was to provide tools for teachers to bring gamified content into their classrooms – content that they created – without the high cost in skills and effort. As with all our products at SMART, we wanted to make things easier for teachers. Above is an example of a ranking game where the teacher provided content on organ systems. And this short video of Monster Quiz gives you a good idea of how SMART lab can work in a classroom. As we developed SMART lab and integrated it with our other tools, we evaluated it with teachers and got some great feedback that led to learnings about how best to scale gaming in classrooms – both to support teachers and engage learners. Here are some of the things we found. I’ll start with one of the most important things we learned: game content can augment the learning process in the classroom, but it doesn’t replace it. Teachers must still play a critical role in the use of games in a classroom. Our goal was to let the teachers provide their own content, but more importantly, allow them to continue to be the director of the learning experience, not the game. For example, teachers who are effectively using games in classrooms often build time around the use of the game to reflect on the learning that happened – the content and the experience. This completes the learning cycle. When games do this, they are easier to incorporate into classroom activities. Teachers need scaffolding too, particularly with new technology and new approaches to learning. We wanted teachers at all comfort levels with technology and games to be able to experiment and get started quickly without in-depth training or professional development. We developed a Creation Wizard that walks teachers (and learners in some classrooms) through the short process of creating a gamified activity. The Creation Wizard also provides some detail around how and where to use the different activities pedagogically. Facilitating the process of using such tools makes it more likely that teachers will use them. From our extensive research into how teachers work, we know that they are looking to borrow and tweak other content, especially content created by other teachers. Our SMART Exchange is a content repository for teachers with a rich set of gamified activities built with SMART lab as well as other related types of content. Content repositories help teachers see how the tools can be used in different ways both from a game play perspective and a pedagogical one. 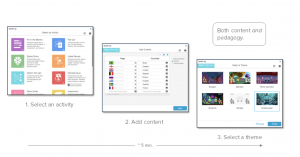 And starting with ready-made content makes it easier to scale the use of games that teachers create. Keeping it simple generally goes without saying. However, when we first started developing SMART lab, each activity was its own separate tool, with a different way to create the activity, provide content, etc. It grew organically and as a result, there were a lot of usability issues preventing adoption. Once we had “critical mass” of a diverse set of activities, we stepped back, streamlined and simplified everything based on feedback from teachers. After we did that, we saw both adoption and regular use climb. 44% of our users use SMART lab daily and another 38% use it weekly. Teachers were able to use it much more easily and quickly. As importantly, as we create new activity types moving forward, we can simply slip them into the workflow of creating games that teachers are already familiar with. We all know teachers tend to suffer from time bankruptcy. To scale the use of games in classrooms, teachers need to be able to do everything fast. And that’s just in the advance lesson prep that they usually do at home. We wanted to take this a bit further though and enable teachers to use our tools to actually create games during class – even allowing learners to do so. We learned from our teachers that sometimes, games can be a great way to capture a learning moment during class. We targeted 5 minutes as the amount of time it should take a teacher to create a gamified activity so that we could really enable their ability to use it regularly, often, and in class. We found that teachers could easily add the relevant content based on their lessons. We made the gaming component fast and fluid. Once created, teachers can easily swap content and/or themes, which gives their activities more “legs” over time. The ability to create games quickly is probably one of the most powerful in scaling the use of gaming in classrooms. Playing the game is only part of the process. If we enable the capture of the results, then an activity goes from game to formative assessment. Teachers value the ability to make any assessment – formative or summative – fun. Learners do too. By capturing how learners or teams do, SMART lab activities are a lightweight way to bring gamified formative assessment into the teacher’s lesson flow. We designed our lab activities so that they combine motivating game mechanics like competition and instant feedback with sound pedagogical scaffolding like making distinctions and recognizing relationships. When teachers then add their own content, we enable the symbiotic relationship between learner engagement and formative assessment. Automating formative assessment makes it more likely that teachers will use gaming in the classroom without the extra overhead of adding it later. As we all know, evaluating products with users is critically important. You rarely get something right the first time. 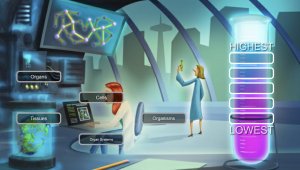 We tested the SMART lab activities in the lab to find usability issues and understand where we had flaws in everything from game mechanics to pedagogy. And we had a few epic flaws and failures – as our teachers, and students, candidly pointed out. A bigger takeaway and best practice, though, is testing in the classroom. That’s where we really gathered insights for how to scale the use of games. We designed several activity types based on problems or opportunities we saw within the classroom. The Shout it Out activity was one. While not a gamified activity, it serves the purpose of allowing teachers to quickly gather feedback and input from learners on in-class activities, including SMART lab gamified activities, that speak to “Reinforcement, not replacement” above. We were fortunate to gather feedback from many teachers in our process of bringing games to classrooms at scale. They asked for several different features and capabilities and most were great ideas. We found some of the most insightful, and obvious, needs though simply by watching teachers in their classrooms. For example, we did some early paper prototyping for a “fill in the blanks” activity that was well-received by teachers and learners. Watching learners use this prototype collaboratively on an interactive flat panel highlighted a key flaw: we didn’t leave enough space for learners to work out math problems. As adults, during design, we could all do the math in our heads. Teachers reviewing the early prototypes didn’t mention this need, nor did learners. We found it by watching teachers use the prototype in a real class. Learners were trying use any small space we left them to work out the problem and were struggling to find space without even realizing it. Not everything is as obvious as it might seem. Teachers often let learners help in classrooms with small group rotations. Small group rotations allow learners to work in independent groups while the teacher moves from group to group to help as needed. 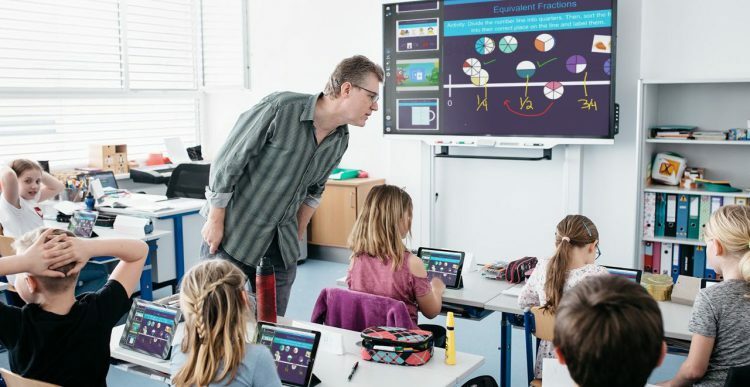 What’s key in using technology in the classroom in general and in gaming activities in particular, is to enable groups to work on their own independently, allowing the teacher to focus on specific groups in turn. Setting up an activity, restarting it for a new group, etc., all take time. We took advantage of the fact that kids are naturals with technology and games in our designs and made it easy for them to do some of these “administrative” tasks involving the games. They felt empowered and the teachers could focus more on helping the learners learn. Next time, I will talk about the many interesting and fun ways we learned to engage learners as we brought gaming to classrooms at scale. Stay tuned for part 2 of this blog, coming next week!